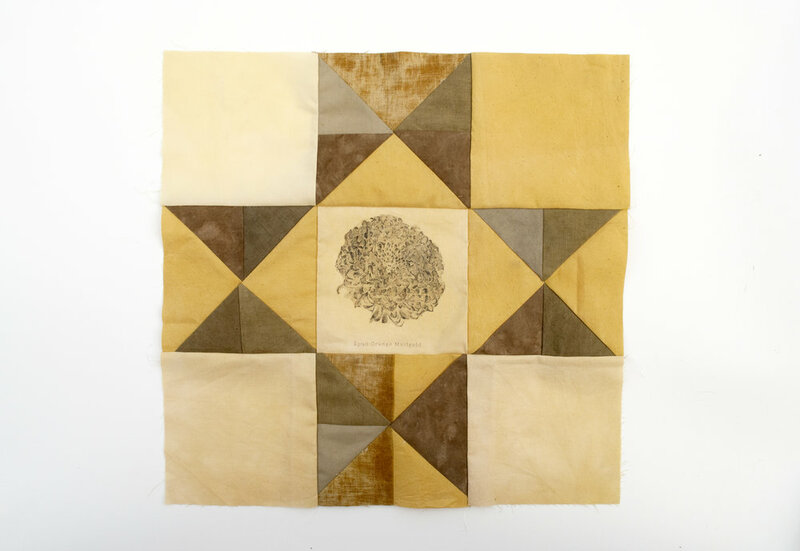 Using material from plants and flowers I have grown from seed, this series is an exploration in quilting with botanical materials. The aim is to eventually create quilts 100% from natural materials that educate about native plant species, biodiversity, and ethical growing practices. This current body of work draws attention to parallels of plant life cycles and seasons of human life by using botanical imagery. The materials and subjects are motivated by memories of my childhood as they become symbols of people and places and traditions that I wish to capture for legacy’s sake. As a mixed media series, I focus on combining textile, drawing, and print media to explore metaphors of plants moving through stages of life and death. The imagery lends itself to scientific observation as well as aesthetic documentation of plants, and both are intended clues as to how humans move through life. Simultaneous to this artistic media, I have grown, maintained, observed, and saved seeds from my own backyard mini farm. I am currently in my third year of collecting and building a seed library from my plants, most of which are considered “heirloom” because of their travels through many generations of seed-saving hands. By photographing plants at various life stages, drying plant parts, and saving seeds, I am able to transform the imagery and material into printed, drawn, and sewn explorations of botanical forms. With the visual repetition of shapes and lines, as well as the manual repetition essential to acts of sewing, dyeing, drawing, and printing, attention to these life cycles gives a sense of rhythm to living in human seasons of life. Yet these patterns also notice underlying and undeniable issues of sustainability that are inherent in both plants and notions of legacy. Over the past three years as I have explored seasons and sustainability, I find these two themes irreversibly intertwined. Sustainability determines balance not only on an environmental stage but in any scene of life where legacy is the script being written. Sustainability keeps, holds, remembers, and saves the heirloom. The next step for bringing together all of my media exploration and botanical research in this heirloom-saving concept is through a united series of works. The media I wish to use is an object that is most recognizable and powerful for its association with memory and the “heirloom”: the quilt. Creating a series of quilts as the next stage of my heirloom series will bring this media, both art and plant, into aesthetic cohesion.